Attila Resources (ASX: AYA) has been granted approval by the USA’s Mine Safety and Health Administration to re-enter the historic Coke Mine No.1 at its Kodiak Coking Coal Project in Alabama. This development comes as AYA accelerates its Definitive Feasibility Study (DFS) by appointing two high profile mining operators to handle the surface and underground aspects of the mine plan. AYA has a 70% stake in The Kodiak Coking Coal Mining Project in Alabama and has 126M tonnes to exploit there after the discovery of a second inferred JORC resource of coking coal. AYA is working to bring a 2Mtpa mine on stream by 2015. 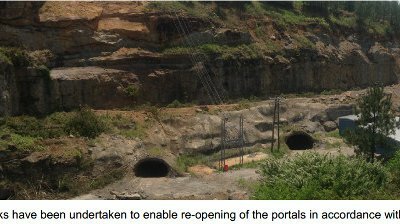 AYA says the existing portals, leading into Coke Mine No.1 were found to be in excellent condition with minimal roof and floor preparation needed. The portals are the tunnels that permit access to the underground mine for both workers and the extraction of coal. The primary ventilation circuit has been reestablished, sites works on the highwall and portal have been completed and a dewatering effort has lowered water levels in the mine enough to allow a bulk sampling programme to go ahead. These samples will be collected for marketing and research and AYA says the samples will form the basis for the key design work at the mine which will take place in the coming months. All site works at Kodiak have been completed to MSHA standards and full approval has been secured from the regulator to re-enter Coke Mine No.1. AYA’s Chief Executive Officer, Scott Sullivan, says the successful re-entry to the Kodiak mine is a key milestone for the project’s success. The DFS for AYA’s Kodiak coking coal project is expected to be completed by the December quarter of 2014 and the company has appointed two specialist engineering firms to complete the design work. preparation and handling of the coal and surface infrastructure. Sedgman specialises in the design, construction and operation of coal handling and preparation plants and has over 30 years’ experience in the industry. Sedgman are the world’s first specialist engineering company to own and operate coal preparation and handling infrastructure. and Gunnedah Basins. They have also delivered major coal projects in emerging coal regions including North America, Mongolia, South Africa, Columbia and Mozambique. The consulting and engineering firm Norwest has been hired by AYA to concentrate on the mining aspects of the DFS including mine planning and design, hydrology, geotechnical design and ventilation engineering. Norwest has undertaken projects for leading resource companies and banks globally and with extensive experience in North and South America. The company has over 250 employees in offices in USA, Canada and India. Contracting top tier firms like Sedgman and Norwest are strong indications that AYA is serious about moving forward with its production plans. An engineering workshop was held on site at Kodiak in May with key engineering and executive staff from Sedgman, Norwest and AYA meeting to discuss the DFS. It was also decided at this meeting to conduct a limited round of drilling into the Coke and Atkins seams to allow further understanding of the coal strength parameters of the resources. Coke and the Atkins coal seams. Samples of the roof, seam and floor have now been taken for both seams and sent to Norwest for geotechnical analysis. These results will complement the existing data on the mines gathered by AYA and will influence the mine’s design. Norwest has already analysed geotechnical data from AYA’s Phase 1 drill program at the Coke and the Atkins seams, the two main areas that will initially be targeted for production. Coking coal is a high quality form of coal mainly used during the steel smelting process. It sells for around $140 a tonne and demand is growing steadily due to rising capacity from the global steel industry. The coking coal AYA will mine at Kodiak is rated highly due to low ash and sulphur content. AYA’s aim is to bring a 2Mtpa mine on stream by 2015. To begin production straight away, AYA needs to raise up front funding of $52.1M. It can also have a staged development if it raises $27M or more. The reason capex is relatively low for this project is because infrastructure such as a processing plant, washing facility and cargo loading areas are already in place. These savings, combined with the high grade quality of the coking coal resources, have the potential to put AYA in the lowest 10% of metallurgical coal producers. AYA’s Kodiak mine is located in the Cahaba coal basin in Alabama, a coal rich area that has six mineable seams. The Kodiak mine has its own railway spur and loading facility as well as access to Alabama’s highway system and river barges. The port of Mobile is 350km to the south and accessible by railway. Mobile’s port has the ability to load ships capable of traversing the Panama Canal which allows AYA easier access to Asian markets. AYA’s main efforts at Kodiak are at two properties called Gurnee and Seymour. Gurnee holds a JORC inferred resource of 48.2Mt and is close to the existing mining infrastructure. Earlier this year AYA’s exploration effort at the Seymour property found a second inferred JORC resource comprising 48.3Mt of high quality coking coal. This discovery increased the company’s global resource by 61% to over 126M tonnes. AYA has large land holdings and there is potential for more exploration and discovery of additional resources. Its Big Bone seam has an exploration target of 45Mt, the Gholson/Clark seams have a target of 2-3Mt and the Upper Thompson seams are going after 11-13Mt. AYA wants to use these resources to become a leading mid-tier coking coal producer. The DFS currently underway is a crucial step to bringing the 2Mtpa mine on steam by 2015. The main considerations for the DFS is how to bring the existing infrastructure back online and integrate it with the historic coking coal mines and new resources. After AYA found its second JORC resource at Seymour, the Australian stockbroking firm Hartleys issued a new research note on the company. Analyst Mike Millikan says he continues to recommend AYA as a Speculative Buy with a 12 month price target of $1.85. Millikan says AYA has exceeded its initial estimates for coking coal resources and is well positioned to start early production. He says the existing infrastructure that’s in place will reduce capex and provide low operating costs that are expected to generate solid cash flows. However, he says AYA faces many risks including the variable price of coking coal. He says there is some market commentary suggesting that Q2 coking coal prices may fall below Q1 prices of US$143/t, with some forecasts for prices of US$125-135/t. But he notes that contract price discussions are still underway. Millikan also says the thin seam mining AYA will be undertaking is potentially challenging and the previous Coke No.1 mine was forced to close in part due to adverse mining conditions. He says Hartley’s believes that “AYA has the skill and experience to design and execute a mine plan to mitigate these issues”. The Definitive Feasibility Study now underway at AYA’s Kodiak Coking Coal Project in Alabama is expected to have all design work completed by December 2014. Re-entering the Coke No.1 mine, gathering samples and developing a mine plan for above and below ground operations will be a priority for the company. Once completed, the DFS will allow AYA to move toward a decision to mine and then initiate production at Kodiak, either exploiting the Gurnee resource first or simultaneously mining the Seymour resource. This will depend on what is decided by the DFS being designed by Norwest and Sedgman under AYA’s guidance.